PDT, the legendary East Village bar that’s famous for creating hot dog odes to chefs, is premiering an extravagant new snack: Caviar Tots. It’s the middle of summer, the time when farmers markets are the most popular places on earth and everyone goes into a burger coma on the weekend. So let’s highlight a dish that has nothing to do with summer; in fact it’s the glorious opposite. PDT, the legendary East Village bar that’s famous for creating hot dog odes to chefs—like the kimchee topped Chang dog—has a brand new tater tot dish that premieres tonight. Meet the super luxe Caviar Tots. 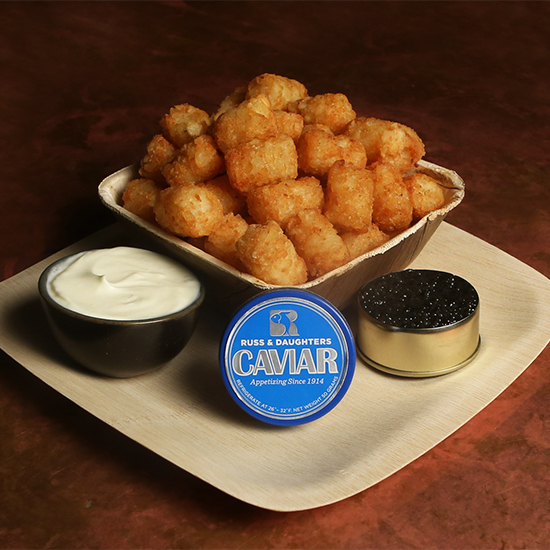 A collaboration with Russ & Daughters, Caviar Tots feature 50 grams of their excellent Paddlefish Caviar, served with crème fraîche on top of crispy fried tots. They’ve been so popular on the bar's New Year's Eve menu that PDT has decided to add them to menu as a full time extravagant snack. If you’re lucky enough to be at PDT when bar manager Jeff Bell is mixing drinks, he will recommend a very dry vodka martini (6:1 vodka to dry vermouth), with a small lemon twist to accompany those luxurious tater tots.